Louise Palmer is a woman solidly set in her ways. She wants nothing more than to have life remain exactly as it is and, after thirty years of marriage, she’s certain husband Clay feels the same …that is until an unexpected inheritance changes everything. When Clay announces an intention to quit his job and move to Florida, her life is thrown into turmoil. He’s determined to go. She’s determined to stay. And, she’ll stop at nothing to prevent the move. The result is a hilarious string of hijinks that will have you laughing out loud. In order for the marriage to survive, Louise and Clay must both discover what matters most. Before it happens, their love will be tested, family relationships will fall apart and the friendships Louise treasured will change dramatically. This giveaway starts April 07, 2018 and ends on April 25, 2018. One paperback book of What Matters Most will be given away to one lucky winner in the US. International winners will receive an eBook copy. The winner will be chosen at random from the comments on this post. Please answer the question – What Matters Most to you? My relationship with God and my family. My family will always be what matters most to me. That would be family. No matter where they are. Would like to see more often but always in my thoughts and prayers. Thanks for this opportunity. Would love to win this book. Thanks for chsnce!! My biological family and my church family are what matters the most to me. Having faith in God that everything in life will be fine. What matters the most to me are faith and family. I am blessed that my husband shares my faith and that I have family I can always count on. God. My family and my country new the most to me. What matters most to me are my two living children and my beautiful granddaughter! They are all I have left family wise. Faith is up there, and friends ! Family and friends mean the most to me. Absolutely would be family, but also – I need to to create. It is crucial to my wellbeing. My family, friends and my three dogs. Thank you for the chance. My family with a special nod to my husband who is always by my side. What matters most to me is my family. My husband passed away in 2013. My life now is God , my children and grandchildren. I love your books. I have just discovered them recently. I read one after the other. Would love to win this one. Love of and for family matter most. What matters the most to me is that I am happy with who I am. My love of Jesus Christ. Family matters most to me. Without family i would not be the person i am today. My family matters most to me. Easy..my family matters most! My son, his wife, and their 3 sweet adorable babies that make my life worth living. My husband, 4 kids, and my furbabies! They are everything! Love your neighbors as yourself! My relationships with God and family. My family is what matters most to me. I love the music that my sons, daughters-in-law, and grandchildren make as they catch up on everything that has happened during the week, their laughter, and the running of little feet. Nothing is more beautiful. The only one missing is my middle son who passed away 13 1/2 years ago, but the sound of his voice and his deeply resounding laughter still fill my thoughts and mingle with the sounds of his brothers and their families. He is always with us in spirit. I treasure every moment and every memory of each time my family gets together. Nothing matters more. My 2 sons and one current daughter in law and one former daughter in law! Right now, silly as it may sound, what matters most to me is that my son not marry the young woman he’s been seeing for the past three years. Getting to see my first grandchild born! My family. All of them. What matters most to me is my family, definitely. Being happy and healthy….and grandkids! This sounds like a lighthearted fun book. Would love to win the e-book. Thanks for the opportunity to enter this contest. Family is by far what matters most to me. I hope that my example of always making family my first priority, no matter how tired I am or what I have going on in my personal life, will teach my son who is 13 that nothing is as important as family. In today’s busy world family dinners, visits with grandparents, and important family conversations are often pushed aside for other less important things. Every member of a family from grandparents all the way down the line have invaluable lessons to teach younger generations. After loosing my dad last year I am so thankful for all the time my son spent with my dad. Those moments spent listening to old stories, playing chess, gardening, and collecting countless hugs and kisses from his grandfather are the things that will help teach my son how to be a loving husband and father himself one day. My son sat by my dad’s side for over 24 hours and held my dad’s hand as he took his last breath. Kids may not understand why family is what matters most when they are young. But, if we lead by example and show them what matters most from day one they will eventually understand that family is the greatest gift of all. My family matters the most to me. And my group of girlfriends would be next. Thank you, Bette! Family, friends, good health. I love your stories. So memorable with characters I’d like to meet! My family and my dog Jaxon is what matters most to me. Thank you for the chance at a wonderful book. What Matters Most to me is my relationship with the Lord. My husband, daughter and son mean the most to me. Also our puppy is right up there with them. That my family is well. I’ve moved to Florida so this book sounds like a must-read. My family, good health and lots of good books matter most to me. My relationship with Jesus Christ and my family are what matters most to me. WHAT MATTERS MOST TO ME IS MY FAMILY AND GOD. What matters most to me is the love of my family! Especially my grandson who is 6 months old. He’s my first grandchild and I knew it was going to be very special but I had no idea how much he would steal my heart! God and my family foremost. It has to be family! Without them where would any of us be. My family and things going on in my life. I’m not sure if I already entered so I will enter with this answer. My beautiful God & His love means the most to me. 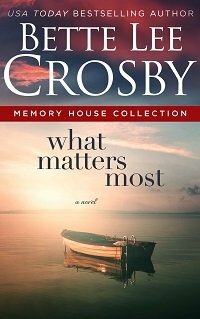 I love your books and would love to win a copy of What Matters Most! Thanks for the opportunity to win! My family matters most. And I would love a chance to win this book! Family and friends. This book sounds great! My family means the most to mean. My family is the most important. Sounds like a page turner. Hope to win so I can read!!! My son and grandson are the most of my life along with reading! Thanks! My relationship with God! Everything else branches off from that relationship! I don’t have just one thing that matters most. My family, my freedom, and my education are three of the most important things in my life. My family and my faith in God matter the most to me. They have seen me through both good and bad times and never fail me. They are my source of strength. I would love to win this book! Faith and Family matter most to me. would love to read this! thanks so much for the chance to win! Thanks for the chance to win a copy of this book! It sounds like a great read. My sons. Keeping them happy and healthy. Developing a more adult partnership with my husband as we approach an empty nest. What matters most is to keep faith in God, my health after several issues, and my small family after several losses. Thanks for the book offer. Sounds like my kind of read. Your books are awesome! Putting it on my Wish list! My family is the most important part of my life and they matter the most. I’ve told my son since an early that I love you the most. I would love to read this book.Thank you for the chance. My family is what matters most. Would love to win, and read a new author. What matters most would be my relationship with God. I cannot be the best me, daughter, sister, aunt, friend and employer without God. He prunes my character so that I can be a reflection of who He is. Because of him I thrive to love deeply, forgive often and live life to the full. Thanks for the chance. What a SUPER Prize!! Thanks for the chance. .what a Great Prize! Oh, I hope I saw this in time. Would love to win this book and share with my sister!! Would love to win! Good luck everyone! Thank you for the opportunity. What an awesome chance! Thank you so much! This sounds like a fun book! I would like to win! What a fascinating book! Would love to read this book to see just how fascinating it is! What matters most to me is my family and friends who has helped me tremendously thru my breast cancer, bilateral mastectomies and the reconstruction plus the surgeries afterwards with my implants and them keep coming out of place. Hoping that the surgery I had Tuesday April 17th will finally fix my implant problem. God, my family and friends. I would be thrilled to win this great giveaway! Thanks for the chance! What matters to me most is doing my dialysis so that I can be around for my children and grand children….and to read … I read every time I go to dialysis to pass the three hours by and they do fly by….. then I’m in a rush to get home to continue to read… God, my health and family are most important to me but reading gives me the freedom that I need to escape at times…..
What matters most to me is telling others that Jesus loves them and what He has done in my life. My family is what’s important to me as well as my friends. My family is what matters most to me. I would say family. Having people around you that you can count on. I have to say family is what matters most, they love you unconditionally they are there for you and support you in everything u do! They are there when you need them in good times and bad times! Being close to my family means the world to me! Being healthy and happy and everyone around me the same. Definitely my family and friends! Family! Especially my four miracle grandchildren, all born premature! God, Country, my family including our Molly Dog and the Kat Kids and animal rescue. I would be thrilled to win any of your books. I would love to win a copy of your book. I enjoy seeing and reading your posts. Thanks for having the giveaway. My family is first and then my church family…they both matter a lot to me! My family and friends are what matters most. I would love to win a copy of your book. Thank you!! My daughters and grandchildren. I wish for them to have good health. Love all of your books!! Haven’t read this one yet but it sounds great and I would love to win it! Thanks for the chance! 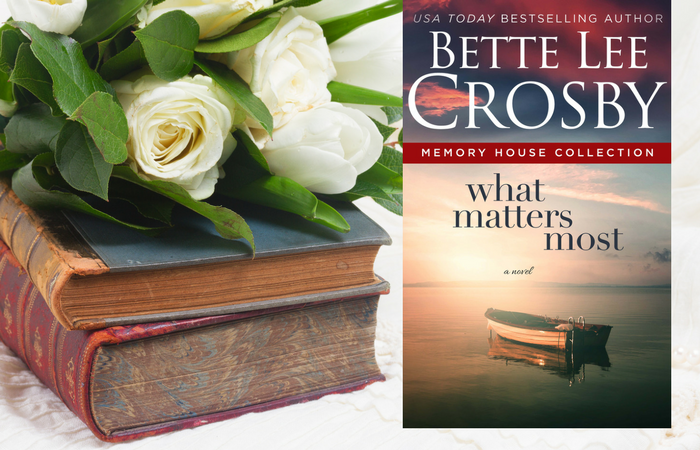 I’d love ❤️ to win a copy of What Matters Most! Like most people, what matters most to me is the health and happiness of my family and myself. Also, world peace! What matters most to me is the family God has blessed me with. My husband especially. Because of him and “us” we have three beautiful daughters and they have beautiful families we adore. My family matters the most to me. My family includes blood relatives, friends, pets & anyone/anything that I have included into my life. Family and happiness are the most important! Family and friends are most important to me always. PS Thank you for this giveaway. Would love to win her book!! Her books are so amazing and so good! Family, love we had a rocky start but everything is fine now. It sounds so interesting and fun to read with hi jinks! I can’t wait to read it. What matters the most to me my family kids and grandkids. My wonderful husband and my amazing daughter. I would love to read this! Bette Lee Crosby is simply the best!! My family and being a good role model for my 4 kids. My husband, our life together coukd be anywhere as long as it’s with him and my furbabies. Family, which includes pets, and friends matter most; and, if the love of the aforementioned could coexist with a peaceful life, that would be just grand! What matters most to me is my Life in Christ, my family and friends. This looks like a very good book!!! Woohoo!!! Thank for for the chance! That my friends and family are happy . This is on my tbr list! I enjoy all your books and anxiously await this story! Thank you so much for the chance to win! What matters most to me is my family and the love we all share. Just added a new granddaughter a week ago, so the circle is growing. My family matters the most. I especially want to see my grandchildren succeed in life. Thank you for the great giveaway chance!! This sounds like an enjoyable book. My daughter and my dogs. My family is what matters most, their love and happiness. Family and friends! Thanks for the chance! Would love to win and read your book!